This tutorial shows you how to use Azure Active Directory (Azure AD) B2C to sign in and sign up users in an ASP.NET web application. Azure AD B2C enables your applications to authenticate to social accounts, enterprise accounts, and Azure Active Directory accounts using open standard protocols. In the tutorial that you completed as part of the prerequisites, you added a web application in Azure AD B2C. To enable communication with the sample in this tutorial, you need to add a redirect URI to the application in Azure AD B2C. Under Reply URL, add https://localhost:44316. In this tutorial, you configure a sample that you can download from GitHub. The sample uses ASP.NET to provide a simple to-do list. The sample uses Microsoft OWIN middleware components. Download a zip file or clone the sample from GitHub. Make sure that you extract the sample file in a folder where the total character length of the path is less than 260. TaskWebApp - Create and edit a task list. The sample uses the sign-up or sign-in user flow to sign up or sign in users. TaskService - Supports the create, read, update, and delete task list functionality. The API is protected by Azure AD B2C and called by TaskWebApp. In the TaskWebApp project, open the Web.config file. Replace the value for ida:Tenant with the name of the tenant that you created. Replace the value for ida:ClientId with the application ID that you recorded. Replace the value of ida:ClientSecret with the key that you recorded. In the Web.config file, replace the value for ida:SignUpSignInPolicyId with b2c_1_signupsignin1. Replace the value for ida:EditProfilePolicyId with b2c_1_profileediting1. Replace the value for ida:ResetPasswordPolicyId with b2c_1_passwordreset1. In Solution Explorer, right-click the TaskWebApp project, and then click Set as StartUp Project. Press F5. The default browser launches to the local web site address https://localhost:44316/. Click Sign up / Sign in to sign up as a user of the application. The b2c_1_signupsignin1 user flow is used. Azure AD B2C presents a sign-in page with a sign-up link. Since you don't have an account yet, select Sign up now. 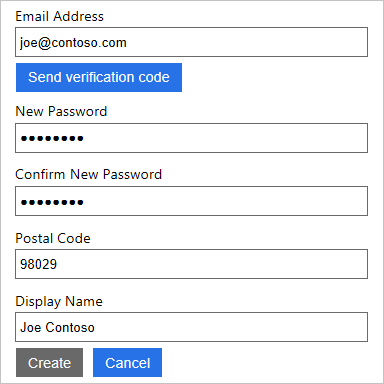 The sign-up workflow presents a page to collect and verify the user's identity using an email address. The sign-up workflow also collects the user's password and the requested attributes defined in the user flow. Click Create to create a local account in the Azure AD B2C tenant. Now the user can use their email address to sign in and use the web application.